This experiment was inspired by the shutter speed experiment. I wondered if there are other parameters of a (video) camera that I could find out with the Blinkenlight Shield. The basic idea is similar to the power grid monitor experiment. I will sweep the LEDs with the expected frame rate. If the filmed picture stays stable then the frequency matches the frame rate. If it moves in the direction of the sweeping phase then the frame rate is below the sweep frequency. In the case it moves backwards the frame rate is higher than the sweep frequency. As in the power grid monitor experiment this is quantitative. The motion in the film will happen with the difference of the sweep frequency and the frame rate. This will allow to infer the frame rate at a much higher precision than whatever the camera says. Thus I will be able to tell if the frame rate matches the nominal rate and if it is stable over time. // Notice that increasing the frequencies may increase the sampling error. // because timer1 has only a 16bit counter. // Since gcd(n, 16000000) == 3 for the frequencies (15, 24, 30, 60) the generator may be somewhat to slow. // For example for 60 Hz (the worst case) we will have 16 000 000 - 60*20*floor(16 000 000/60/20) == 400. // Thus the worst case error is at most 400 ticks per second or 25ppm. // Since 25ppm is in the order of magnitude of the crystal's deviation we will not compensate for this. // For the other frequencies gcd == 0 and thus there is no error but the crystal deviation. As you can see the code borrows heavily from the power grid monitor experiment. I only added some additional code to be able to switch between the most typical frame rate frequencies. The “get_next_count” function needed for switching is from the wear leveling experiment. The only thing that I added for this experiment are the functions visualize_frequency(), set_prescaler() and visualize_scan_direction(). Let’s begin with the visualize_frequency() function. It will split the target_frequency value into a high and a low digit. Then it will light as corresponding set of LEDs. Thus after each reset the sketch can use it to display the new target_frequency. Otherwise it would be somewhat difficult to keep track what the current frequency setup actually is. The visualize_scan_direction() function will use the set_prescaler() function to prescale the system clock by a suitable factor (I choose 32). Thus it will divide the system clock by 32 making everything slow down. Since it is called after the interrupts are initialized and running this will make the LEDs sweep 32 times slower and thus easily visibile, especially their direction. Notice that the 80ms delay is also slowed down 32 times thus resulting in a 2.56s delay. After this delay the prescaler is reset back to 1 such that everything runs at the usual speed. Since I am going to to use this setup for quantitative experiments I verified the frequency accuracy with my frequency counter. As you can see it deviates only about 4ppm from the target frequency of 30Hz. This is good enough for the purposes of this experiment. Now let’s see what happens if I film the output of the sketch with my DSLR with a frame rate of 30 frames per second. The video starts with the 15Hz mode. I then reset the setup through the serial port with the auto reset feature of the Arduino till I reach the 30Hz mode (35 seconds in the video). Then it gets interesting. The picture is not at all stable. Instead it moves slowly in the sweep direction. It follows that the frame rate is to slow (40 seconds in the video). With a video editor I measured one full cycle between 0:40 frame 001 and 1:48 frame 029. Thus the cycle length is 68*30+28 frames. During that time the camera should actually have sampled 68*30+29 frames. Instead of 2069 frames it has only sampled 2068 frames. 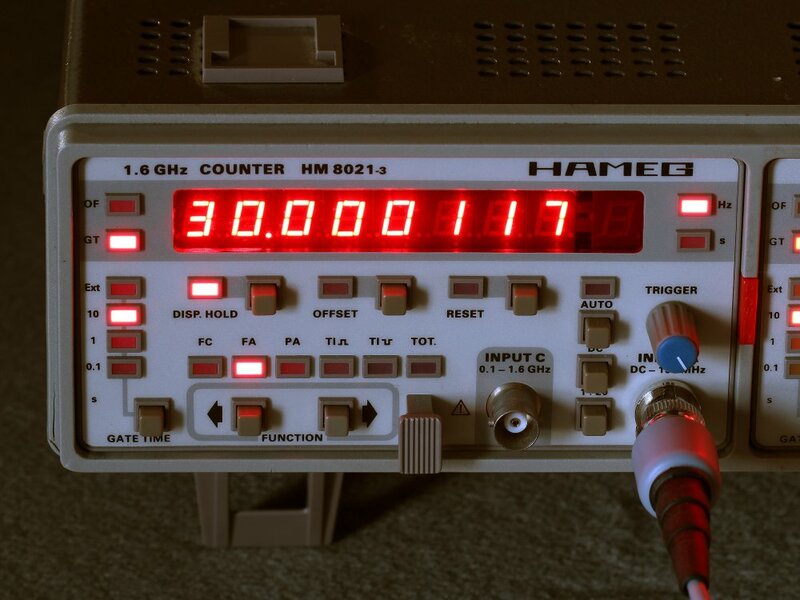 Hence it is sampling at 30 Hz * (2068/2069) = 29.9855 Hz.